My favorite time of year has arrived! It’s starting to warm up, the days are getting longer, and my garden has never looked prettier! 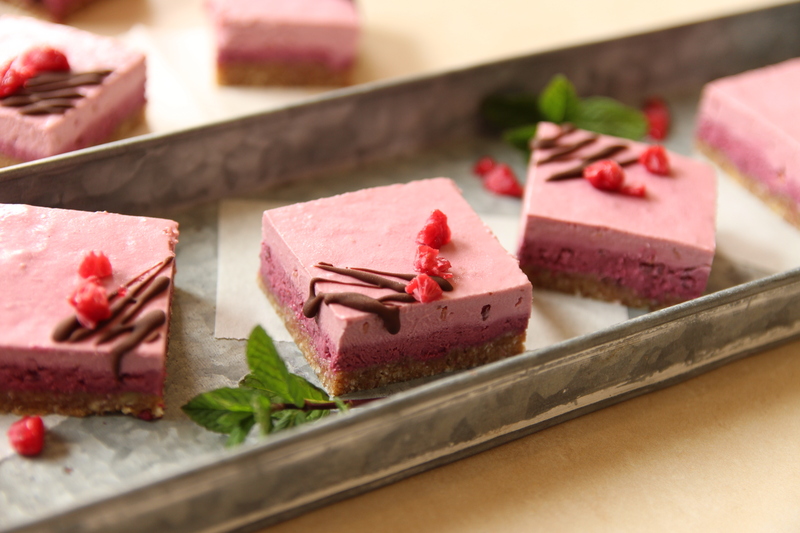 So, I thought, what better way to celebrate, than with these super refreshing, colorful, raw raspberry slice bars? And that’s exactly what I did! They’re also refined sugar free, dairy free, gluten free, and egg free. Yes, they’re Vegan, and taste phenomenal! 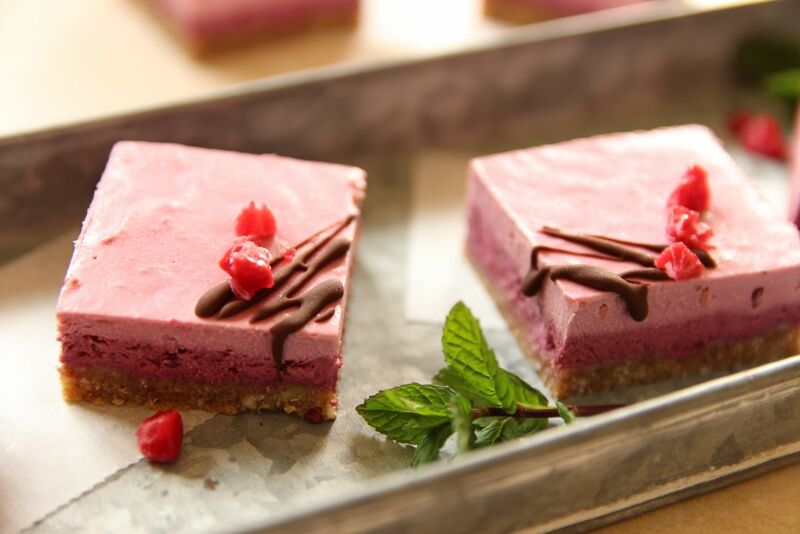 The raspberry slice consists of a nutty base layer, that’s naturally sweet, a super easy, thin, refreshing blackberry layer, and a bright, fruity raspberry layer on top. For the base, add the medjool dates, pits removed, into a food processor, and blend until it forms a paste. Next, add the almond meal, shredded coconut, and pecans, to the food processor, and blend until fine. Transfer all that goodness into an 8 x 4 x 1/2-inch loaf pan (20 x 10 x 6 cm), lined with baking paper, then form an even base, with your fingers, and set aside. In a small pot, add an inch (2.5 cm) of water, bring it to a boil, then turn off the heat and place a heat proof, glass bowl on top of the pot. Add the coconut oil to your bowl, to melt. Next add the almond butter, and maple syrup, and give it a quick whisk. Finally, add the defrosted, and strained blackberries, briefly whisk, then blend until smooth, and set aside. Repeat the instructions above, adding the raspberries instead of the blackberries. Pour the blackberry layer on top of your base, and even it out with a spatula. If your mixture is too warm, pop the loaf pan into the freezer for 10 minutes, to slightly set. 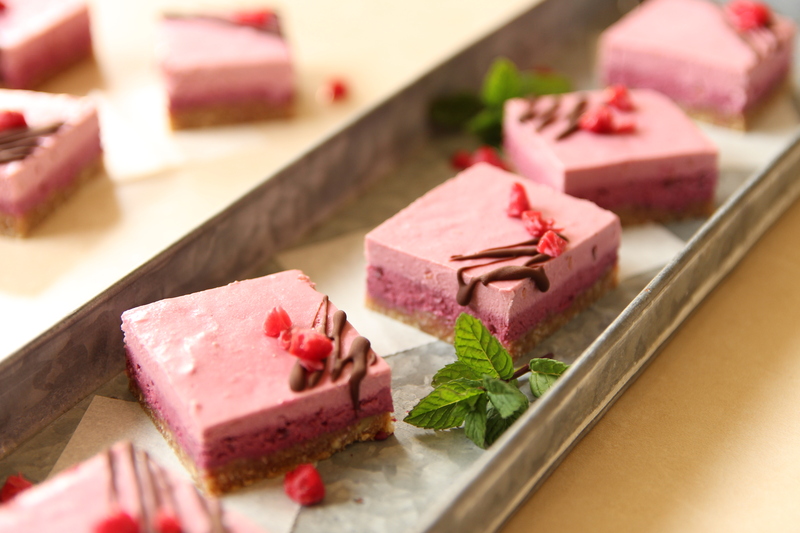 Repeat with the raspberry layer, and pop your raw raspberry slice bars into the freezer for an hour, or until they set. 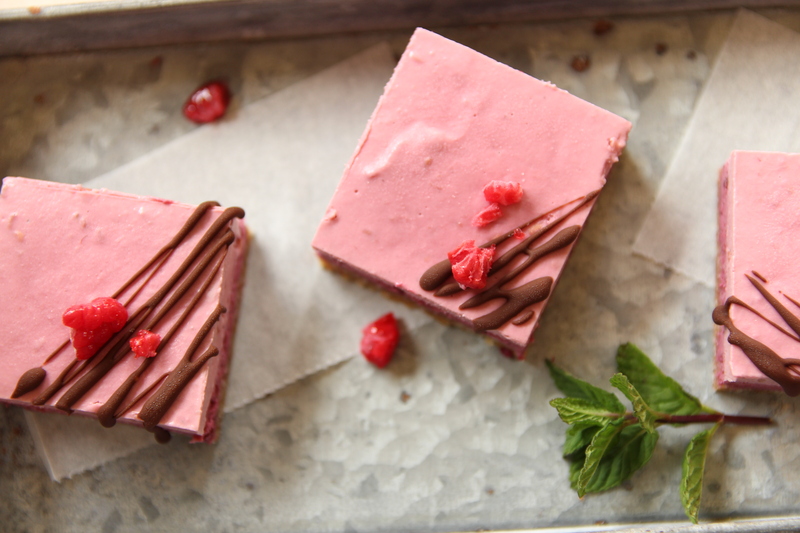 When firm, *slice them into 9 bars, and decorate with a drizzle of melted dark chocolate, and frozen raspberries, before you dig in! *Soak a sharp, smooth knife, in a cup of boiled water, then dry the knife and slice. Repeat this stage with each slice, to ensure a smooth cut! So, there you have it, another quick and easy recipe, bursting with flavor! 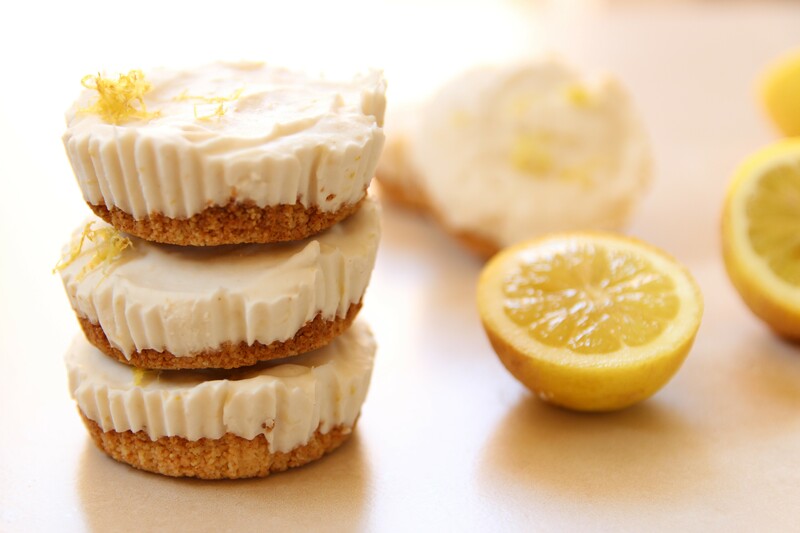 While you’re here, have you tried my super refreshing Mini Lemon Cheesecakes? They’re gluten free, refined sugar free, and vegan, of course! ← Raw Zucchini Salad With Refreshing Mint And Chili! How pretty are those! They would be perfect for Mother’s Day! Can you substitute the almond butter for peanut butter? These look so good! These are absolutely gorgeous! They would look beautiful on an Easter brunch table! Can’t wait to give them a try! Do you need the pecans or can you replace them with something else? I’m allergic to pecans & walnuts. They look amazing and I want to try them ?